DON’T MISS the May 8: Parent Information Evening 7.00pm in the Max Fletcher Auditorium (enter off Phillipson Street). Applications open May 9, Enrolment Forms available at the Information Night or from the College Main Office and Catholic Primary Schools. May 9, 10, 13, 14: School Tours available. Tours will be conducted at 9:15am and 1:50 pm. You can also contact the front office to book a tour. May 27: Interviews commence: for all families who have submitted enrolment applications. Please contact the College for more information regarding enrolments and tours. 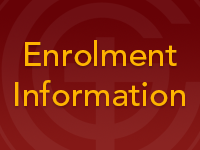 For further information about the Enrolment process at Galen and to download Enrolment Forms, please visit this link.